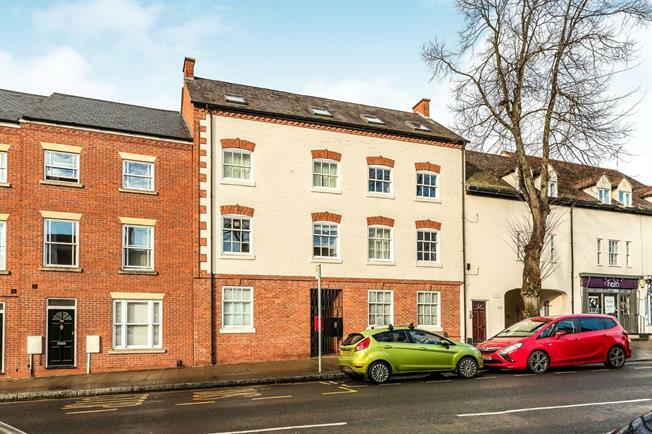 2 Bedroom Flat For Sale in Warwick for Guide Price £190,000. Finished to a high standard throughout this two double bedroom purpose built apartment boasts parking and lift access and is located on one of the most sought after roads in the town, briefly comprising; secure entrance lobby, inner hallway, entrance hallway with doors off to all rooms, open plan living dining kitchen, refitted bathroom and two double bedrooms with views over West Street. Ideal as an investment property or first time buy. Feature wall mounted electric fireplace and two oak effect uPVC windows facing the rear overlooking the rear communal garden. Radiator and ceiling light. A range of built in wall and base units and fitted breakfast bar. Inset sink with mixer tap. Integrated washer, dryer electric oven and hob with stainless steel extractor over. Spotlights. Three piece white suite with low level WC, panelled bath with shower over and vanity unit sink. Part tiled walls and wood effect laminate flooring. Double bedroom with built in wardrobes and shelving and wooden sash windows facing the front. Radiator and spotlight. Double bedroom with wooden sash window facing the from. Radiator and ceiling light. Parking is provided for one vehicle in an allocated space accessed from Crompton Street. Parking permits are also available through the council for a small charge to provide additional parking on street.